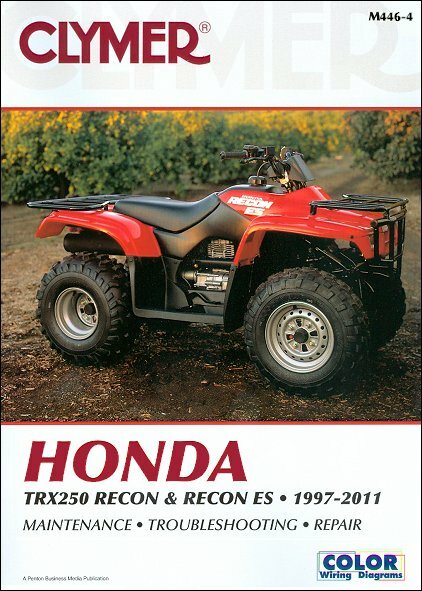 Honda TRX250 Recon, TRX250 Recon ES ATV Repair Manual 1997-2011 is available for only $26.95 from TheMotorBookstore.com. Largest selection of Clymer, Chilton, Haynes, Bentley and Seloc repair manuals at discount prices. Remember to take your Honda ATV repair manual whenever you ride. It will easily fit in your gearbag, toolbox, or glove box. Make sure that doesn't happen to you, your significant other, or the kids. Friends are sorta on their own, unless they have the same ATV as you, small joke there, gang. But really now, a Honda ATV service manual is cheap insurance against the dreaded Ride Day Demons, that show up unexpectedly.